It has been almost a year since I moved into this house to become a Monkey and I'm very happy to report that I'm mostly satisfied with my forever home. I heard the humans discussing how naughty I had become. I couldn't believe they were calling ME naughty! I'm a very well-behaved and distinguished ladycat. Then, after much reflection, it occurred to me that they were calling me KNOTTY! That made a lot more sense but I know this means that they're considering getting a shave for me. My knots have become unmanageable and they are close to the skin so Mommy doesn't want to risk trying to cut them out. Of course it will be nice and cool for the summer but I'm not going to let on that I'm happy about this turn of events. It is much more of an advantage for me if Mommy thinks I disapprove...and I know just the face to use. My dear, you'll be bootiful even in the nood! Bella, that face certainly does show disapproval with the idea of getting shaved. We bet you'd feel better not being so knotty though but we won't tell your mommy that! Bella, if I were a human, I don't think I'd want to get near you with clippers when you are wearing that face! My dear Bella, have you been naughty and not let your mom comb out your knots? I hope she can get your knots out without the clipping, but those things can hurt, too! Oh no Bella, we hate to see you shaved again but it sure would be better than pulling those knots out. But it will be a cool look. And we know it will all grow out. Hope all of you have a really fun day. Oh dear Bella (Hannah meowing) our mum encourages me to sit on her knee for cuddles and she keeps a tiny pair of scissors handy for snipping out knots that won't unravel and (whispers) bits of pooh!! Lucy sits there looking all smug cos she's got short furs. Are you going to get a 'Lion' cut Bella? My friend's kitty gets the Lion cut all the time and she is adorable ~ and since you are so beautiful already, I think you would be extra adorable looking like a lion!!! Oh, yes, that's definitely the face of disapproval, Bella. LOL. Is it only a year? Really, it feels like you've always been there! Maybe because we've only been around the CB for a year and a half anyway. LOL. Awwww bella bella Bella!!! Look at your beautiful face of disapproval!! Awwwwww!!! Me and Charlie hope you have a great time at the tortie beauty parlour soon!! Yay!!! Bella, don't tell Figaro, but he's going to the groomer in 2 weeks! He thinks he's so smart being a pill about brushing. We can hardly wait! Think of it as a spa day Bella. You definitely deserve that! Oh Bella that face is very intimidating indeed!!! That is the purrfect face to make your point sweet Bella!!! Oh, darlin' and most gorgeous Bella.....you make both the boys hearts go pitter-patter!!!!!!!!!! Andy is having a problem with being knotty on his tummy, too.....and mama is trying her best to get rid of the knots. We love y'all so very much. OH Bella! I KNOW what you mean! Mommy has been combing and brushing and untangling me for days! She didn't even know just how bad they had become. I have mire knots in my chest furs and next time I go THERE I will ask them to shave my chestal area. I have some on my back leg pantaloons too. Mommy can't comb and brush those..I lay biteys on her every time. But that's how I got into this situation..not letting her brush. But now, I am. Bella, you remind us of those cute Ewoks in Star Wars. Sorry to hear you are knotty but that is better than being naughty! Oh wow, that is an evil glare!! LOL. With that face, she will never guess that you are happy about the prospect of a shave. Might I suggest the Lion Cut? I hear it makes kittehs look really cute. Oh beautiful Bella!! We knew you could never be naughty...but knotty?? Maybe so. Your mom just wants to make you even more beautiful than you already are!! Getting a shave is better than being notty! Oh Bella! You are absolutely PURRiceless! When I scrolled down to that second picture I just guffawed! 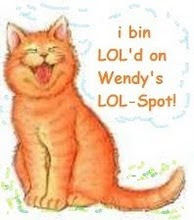 You are a LOL-Cat that doesn't need any captioning! Anyway, if you do have to get a shave, I hope it's not your whole body again. 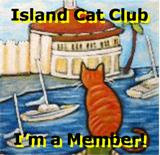 You are beautiful with or without your furs, though, so purrhaps it's more important to be comfortable. Back again! Bella reminds me so much of Sweet Praline. We cannot believe it's been a whole year. We are sure you will feel so much better without the knots! Sorry about the knots though. We are also happy that Maddie is getting better. 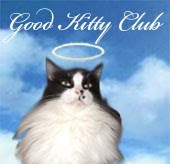 Please pass along our purrs. Bella, what a priceless photo, you're a cutie. All I can say, if you ever see the clipper (totally looks like a monster with big teeth) run and hide! You are lovely. Maybe you should grow dreads and be a wonderful Rasta cat. Love Bijou. Bella, you better not tell them you will like your haircuts! 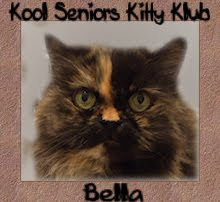 Naughty or knotty, and even with that disapproving kitty face.. you're still a beauty, dear Bella! Oh Sweet Bella, too bad you have to get a haircut but your Mom is just looking out for you. Your pictures are precious.